Play Blackjackagainst the computer dealer with hints from an expert blackjack strategy engine. Play Blackjack against the computer dealer with hints from an expert blackjack strategy engine. 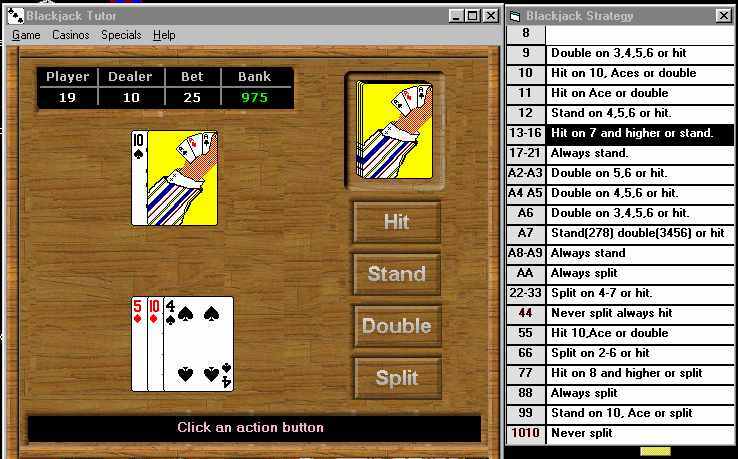 You will soon play blackjack like an expert as Blackjack Tutor shows you when to stand, hit,double and split. Blackjack with correct strategy gives the player maximum odds to beat the Casino dealer. Get more ba-ba-bang for your buck when using this proven system to maximize your odds. No more staring at boring charts to learn a winning system. Enjoy playing blackjack while the correct action for each hand is conveniently displayed next to the slick interface. Expert hints on the best action for each hand as you play. Excellent graphics with smooth animation. Preferences settings and a help file with detailed rules of the game. Shape Solitaire - Unique Card Puzzler with Classic and Arcade modes. Spider Wizard - An exciting spider card game, spider solitaire game based on the classic Spider Solitaire Game. Ada Cartoon Solitaire - A very good Cartoon Game, Matching Game, Cartoon Solitaire Game, find the same pictures and remove them in limited time. Noah's Ark Deluxe - Get ready for a flood of fun! Bring all the animal-matching fun home to your desktop! New Noahs Ark Game for you ! Jigtopia Jigsaw Puzzle - It is the perfect jigsaw puzzle game that is guaranteed to give you hours of fun. Net Durak - You can play against computer or real-life opponents! Net Spite and Malice - Play Spite and Malice double solitaire with your friends and PC ! Prehistoric Pai Gow Poker - With the Pai Gow Poker Game called Prehistoric PaiGow Poker you travel back to the Stone Age. Luxor Puzzle Game - As addictive as it is exciting, Luxor Game is an action-puzzle game that takes you on a thrilling adventure across the lands of Ancient Egypt.